Grizzly bears are one of the most majestic predators on the planet, and there are not many places in the world where you can observe them up close, in their natural habitat. The Great Bear Rainforest, a vast stretch of wilderness on Canada’s remote west coast is also one of the most beautiful – and remote places – to visit. You can only get there by small boat or floatplane, and the area is an ecological paradise - from the big mammals (Grizzly and Black bears; Humpback and Orca whales), to the schools of migrating salmon and the bald eagles that feed on them, down to the infinitely diverse and colorful tidal estuaries. It is also an area rich in aboriginal culture and history. 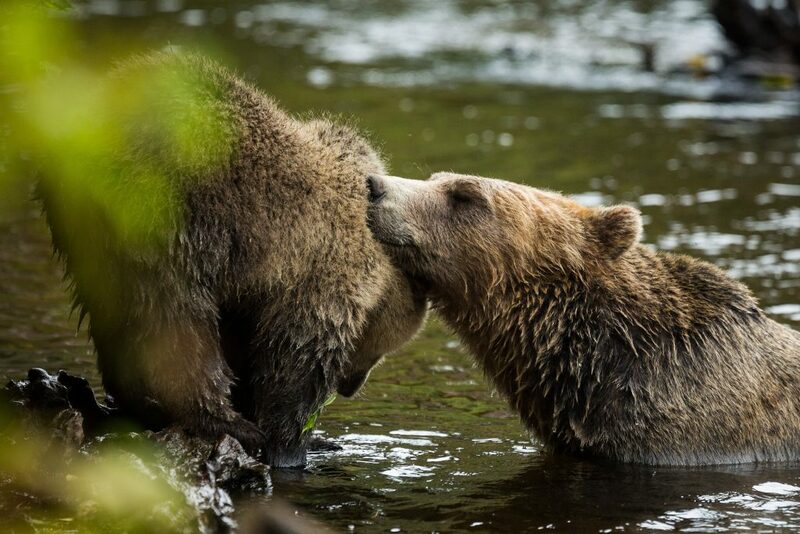 It’s nearly impossible to describe seeing your first Grizzly – breathtaking, thrilling and humbling all in one moment. Keep an eye out too for Black bears, wolves, Bald Eagles and Killer Whales. A photographer’s dream! There are not many places in North America that are more remote. There are no roads to get you there. Typically we fly into Vancouver then travel to the east coast of Vancouver Island, then take a small boat or a floatplane across the Inside Passage to an area of mainland Canada that is a patchwork of deep fjiords and high mountains. The weather can be unpredictable on the north coast but even when the mist and rain is rolling over this temperate rainforest, it is awesomely beautiful and peaceful. After each game drive, you’ll return to a lovely floating lodge nestled on the edge of land and sea. Your hosts include wildlife biologists and nature guides, and in the evening everyone relaxes and shares stories over a gourmet meal and a glass of wine. Overnight at the Sutton Place Hotel. This hotel is situated in the heart of downtown Vancouver, steps from Robson Street’s shopping, and near restaurants, galleries, and nightlife. The property boasts premium accommodations and first-class amenities, including an indoor pool and fitness centre, spa, fine dining restaurant, landmark lounge, and an on-site wine merchant. You have a full day to explore Vancouver. Included is a small group tour, to explore Vancouver’s beautiful North Shore, where you’ll see beautiful ocean vistas and stunning old growth rainforest. This tour takes you to the amazing temperate rainforest of Vancouver’s North Shore. Enjoy light adventure on this half-day excursion into the stunning nature that surrounds the city of Vancouver. This morning you will be taken by private transfer to Vancouver Airport’s South Terminal for your flight to Port Hardy. Enjoy the bird’s eye view of British Columbia’s rugged coast line on your journey to the northern tip of Vancouver Island. Upon arrival make your way to your charming Port Hardy hotel. Be sure to get lots of rest, tomorrow your Great Bear Lodge experience begins. A private vehicle and driver will meet you at your hotel and take you in comfort to Vancouver South Terminal Airport. Today a flight takes you from the Vancouver Airport's South Terminal to Port Hardy.